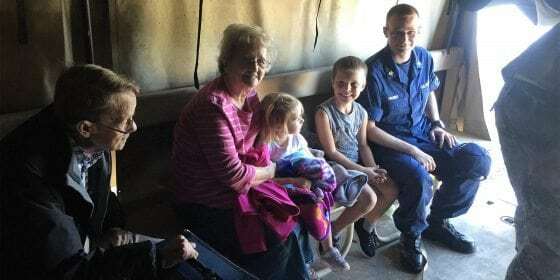 With Hurricane Matthew barreling towards the coastal town of Wilmington, North Carolina, U.S. Coast Guard Petty Officer 1st Class James Prosser and his wife, Nicole, made the seemingly right decision to send their two young children out of harm’s way to the inland city of Lumberton. Little did they know that the small inland town was also going to take a beating. Feeling confident about his choice (Lumberton is located almost 90 miles from the coast) Officer Prosser resumed his duties at the Coast Guard Sector North Carolina. Imagine his surprise the following weekend when he received news that floodwaters in Lumberton were rising rapidly while his children were at their grandparents’ home without running water or electricity. 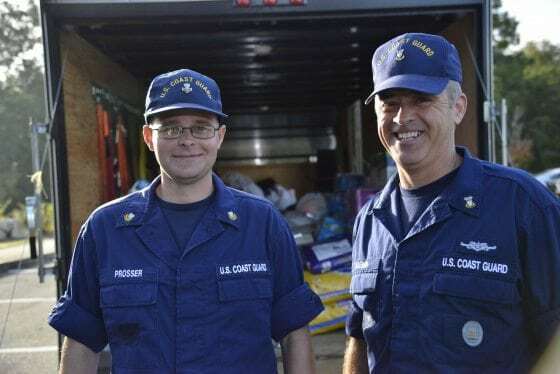 U.S. Coast Guard Petty Officer 1st Class James Prosser and Master Chief Petty Officer Louis Coleman load Coleman’s trailer with donations during Hurricane Matthew at Coast Guard Sector North Carolina in Wilmington, Oct. 16, 2016. “Lumberton has been the go-to safe haven during hurricanes for me and my family for about eight years now,” says Prosser. “But after the town was battered by Hurricane Matthew, following two weeks of unusually high rainfall, it became a dangerous place where water was suddenly filling the streets.” By Monday morning, the levee protecting Lumberton had broken, and Prosser was working feverishly with members of the sector command to determine how to best bring his children home. It quickly became clear that the area was too flooded to continue by truck. Luckily, Prosser and a fellow officer encountered water rescue teams from New York and New Jersey. Prosser found the town unrecognizable and struggled to get his bearings. “Eventually we approached a church that looked familiar. We saw helicopters overhead with people dangling from cables. They were hoisting people from the flooded waters to safety,” he adds. Prosser was finally able to reach the children via SUV. “When we got there, my two children came running out the door,” says Prosser. “While it was a huge relief to know they were safe at that moment, I knew we were all still in danger. We needed to get out of there as quickly as possible, before we got trapped by floodwaters.” Meanwhile, Prosser and additional officials strongly encouraged others to evacuate the dangerous area. As part of the North Carolina family, Coast Guard Sector North Carolina personnel will continue their response to Hurricane Matthew’s aftermath and the subsequent flooding throughout the region. Prosser and his rescued family.